SIX FOR FIVE: 'Big Gangy' Cohen found! The story of Irving 'Big Gangy' Cohen is one of the truly stranger and funnier anecdotes (and there are quite a few) in Brooklyn's troop of Murder Inc. soldiers. Cohen was one of the few hulking brutes in army of mostly small but inevitably dangerous men, and his bulk was counted on more than a few occasions. He was also one of a small handful who managed to run away and untangle himself from the tight web and inner stranglehold that organized crime could be. Cohen had been riding with Walter Sage through the Catskills, the green getaway nirvana for most of the New York’s middle class Jews. It was a perfect, late summer evening with warm wind blowing through rolled down windows. Sage had been running the troop’s Long Island slot machines and word got back to that Sage’s books weren’t balancing. Walter was skimming off the top, and Brownsville decided he had to go. Gangy and Walter were best friends, so who better to put him on ice than he; so worked the mind of Harry Strauss, known as Pittsburgh Phil, the gang’s premier nut case who also happened to call many of the deadlier shots. A nervous Sage feared for his life less when it was Gangy who showed up and suggested they go for a nighttime drive. An unidentified driver was behind the wheel and Sage was planted in the front passenger’s seat. To put Walter at ease, Cohen sat directly behind him, the generally designated kill spot. Harry Strauss had confidence that Cohen would go through with the job, but he still wanted to make sure for himself. He dropped by to see Abe ‘Pretty’ Levine, a blue-eyed kid with misdirected mobster aspirations. Levine was vacationing in the area and the two linked up later that evening with Allie ‘Tick Tock’ Tannenbaum. Within a few hours the trio were following the red taillights of the car carrying Gangy and Sage down a dark country road. From Levine’s perspective in the driver’s seat he could see the car ahead of him begin to swerve slightly, then more violently, before finally losing control and careen off into a ditch nose first. Walter didn’t go easy it seemed. As Levine eased his own car to a stop, he saw Gangy emerge out the backdoor and hightail it into the black woods of upstate New York. In the front seat the driver sat dazed from the accident and next to him Walter Sage, slumped over dead, with what was calculated as thirty two stab wounds from Cohen’s ice pick. They were baffled as to where the hell he had run off to, calling his name out into the darkness a few times to no avail. Gangy Cohen was gone. Pretty Levine and Italian Combination cohort Dukey Maffeotore got their answer one night in September of 1939 when they decided to kill a couple of hours and head to the Lowes Pitkin movie house to catch the film Golden Boy. It was classic Hollywood fare of love and hard knocks; the story of Joe Bonaparte, a gifted violinist turned boxer to make a quick fortune, starring curly haired newcomer William Holden and Brooklyn bred Barbara Stanwyck. As Pretty and Dukey slouched in the dark with popcorn bits sprinkled on their laps, they watched the proceedings of a major fight sequence at Madison Square Garden where Joe is facing a boxer named Chocolate Drop, about three quarters of the way into the film. The film cuts to various reaction shots of the crowd at ringside, as the fight is about to commence. About three shots into the sequence the two couldn’t believe their eyes. Captured on glorious black and white Hollywood film stock was Gangy Cohen as one of fight’s attendees. They could barely contain themselves as they left the movie house and ran down to Midnight Rose’s, the candy store whose back room served as an informal headquarters by Abe Reles and his lieutenants. The news was met with surprise but mostly disbelief. Bets were even wagered as to if it really was Big Gangy, thinking these two kids were nuts. The next afternoon most of the squad sat in the Loews Pitkin to see it for themselves. There he was, just like they said. They shook their heads in disbelief and continued to chuckle to themselves for the rest of the afternoon. “We’ll, if this crime thing don’t pan out, we can always go to Hollywood!” was the joke of the day. The anguish leading up to the murdering of his best friend must have had a huge psychological impact on Cohen, and his midnight getaway into the woods was either premeditated or a soul searching conclusion to that final ride. The world he was involved in promised nothing in terms of safety and he had finally begun to realize it. If they could get him to murder his best friend, whose to guarantee that he wouldn’t be next in line? With perhaps misguided aspirations of being the next George Raft, Cohen had made his way to Hollywood and hoped to re-invent himself in tinsel town and be as far away from Brownsville as possible. He had famous friends in the business that prided themselves in hobnobbing with actual, living, breathing gangsters. He gave himself the screen name of Jack Gordan, and his connections helped him find work as an extra and bit player where he was generally and typically, cast as the heavy. Cohen’s celluloid dreams however finally came to an end when Brooklyn District Attorney William O’Dwyer opened the floodgates by declaring war on Brooklyn’s crime ring fueled by the 200 plus unsolved murders that plagued the borough. Gangy was one of many names dropped by major stool pigeons like Abe Reles, Allie Tannenbaum and smaller fry like Pretty Levine and Seymour ‘Blue Jaw’ Magoon. Ironically, it was his portrayal of a cop on screen that got the attention of a real law enforcer who just happened be watching some unmemorable B picture and recognized him. Gangy’s mugshot was everywhere, posted on the many wanted posters circulating the city and State police stations during the pitched frenzy of the Brooklyn round up. Gangy was picked up in Hollywood and brought back east to face indictments by authorities in Sullivan County, New York. Pretty Levine had taken the stand against quite a few of the major players, but somehow Gangy got his Hollywood ending. With so much large fish reeled in and fried, he found himself acquitted in the process and walked away free, with the credits rolling marking the end to his criminal career. and speaking of Barbara Stanwyck I just watched her in Babyface which was fantastic. 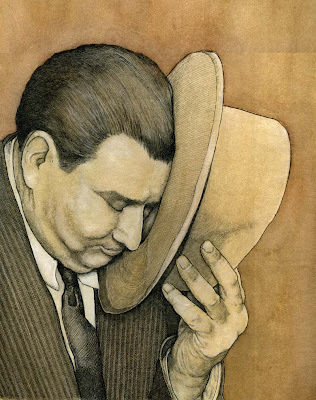 Another great piece, love the posing with the hat. anoymous - i would love to hear more about your Grandpa if you'd like to share about what the rest of his life was like...its always thrilling to hear from family members. My Grandpa, Jack Gordon (Gangy)(they missspelt his name , gordon with a o , not a, a , Was a very loving , gentle man to me and my sisters . He lived across from the Paramount studio on Van ness with my grandmother in Hollywood and seemed like my grandmother , LOL wore the pants in that family . I remeber he kept my sisters and I well stocked on sunflower seeds LOL! They spoke in yiddish when they did'nt want me or my sisters to understand and lit a candel on the sabbath. I remeber he was Hoas's double /stand in on the seris Bonanza, he had a gold wacth that Lauren Green who gave him which Lauren had inscribed on it . Hmmmmmmmmmm I'm going to have to think about this a bit before I write more , but I promise I will be back with more information on him, I'll see if my Dad will write and my sisters about the man. He has passed on now and nobody can hurt him anymore. I do remeber though , my Dad was very secretive about "Grandpa"
THATGIRL - Hi there, we corresponded about your grandfather a couple of years ago when I lived in LA. I would really like to pick up that conversation. My email is arthur.nash at AOL - Hope to hear from you again! who are you addressing in your comment? anonymous - in regards to his grandfather? Hi Pat - Yes, that's correct, we've already been acquainted. And you would think I'd know my own email address, right? Its actually Arthur.Nash at Yahoo not AOL. Sorry! Hi Arthur :)..... yes I remember you. Hows the book going? Anonymous is my brother. I remember the sunflower seeds and the money he slipped us kids all the time LOL. It was never proven that my grandfather killed Sage and according to sources, he didn't, but..... it wasn't a family topic as my brother said. I met "Gangy" or Irving or Jack in the mid 50's. My Father was his business partner in sales until themid 60's. The wildest characters you will ever want to listen to. Great story tellers and all true life events. Hi Pat, I am the other sister to anonymous and ThatGirl and grand daughter to Jack Gordon aka: Gangy Cohen. As both my brother and sister stated, we all knew him as grandpa. As kids, we spent many weekends at our grandparents house. Grandpa always slept on the sofa while the three of us piled in bed with grandma on the bed. I am sure my brother and sister will remember the famous meatball song which we all would sing...leaving no meatballs for grandpa. Every sunday when we were at their apartment across from paramount studios, our grandfather would take us to the corner market and buy us iceream cones and a plastic multicolor ball which each of could pick out. I remember many times playing ball in the paramount parking lot with my grandfather and brother. Our sister was very young at the time. He was big, gruff, smoked cigars and had a nasty smokers cough. He would chase us around the apartment with his false teeth when he removed them from his mouth. He was a great grandfather to have. When we were not staying at my granparents house, they came to our house every sunday, bringing locks and bagels with cream cheese and sunflower seeds for my mother because that was our mothers favorite snack. It has been over 30 years since he died and I still miss him and think about him often. Gangy will always be Gangy. I met him in 1955 as a kid and last saw him whem i was drafted in 62. I knew all about his exploits as my father new him from East New York -Brownsville , Brooklyn. A nice guy with a historic past. 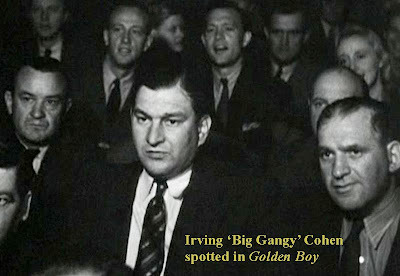 Unusually the mob did not hunt down Irving "Big Gangy" Cohen and kill him but following his appearance in Golden Boy he was arrested for the murder of Walter Sage. His defense was that he was in the back seat, Sage was in the front seat and was killed by Jack Drucker who was sitting next to Sage. Some reports say that Gangy was accidentally stabbed whilst the murder was taking place and he may have thought that he was going to be killed next. The jury acquitted Gangy and he returned to Hollywood. As well as the appearances mentioned above, he was in Crime Inc (1945) which is also now available on DVD. Recently watched Crime Inc. on DVD. The transfer to DVD wasn't particularly good but watchable with an interesting plot about several fictional events which resemble events that happened in real life. The movie covers the period, presumably 1930s, when some mobsters were organized and belonged to a National Syndicate and New York/Atlantic City locations. One gangster wants to stay independent and a contract is put on him. He evades this and kidnaps one of the Syndicate members, who owns a night club. He is paid $100,000 for the safe return of the Syndicate member. The main character is a resourceful newspaperman who seems able to infiltrate both the police and the underworld. He decides to write a book about the Syndicate and its group of killers which he calls Crime Inc.
Cohen plays a hit man with Crime Inc. His facial expression and the tone of his voice never seem to change and his body movements are a bit awkward but interesting to see the real thing compared to a James Cagney or Edward G Robinson. I'm compiling a list of Jewish mobsters and those associated with the mob for a reference book in the UK. Does anybody have dates (i.e. year of birth and death) for Jack Gordon aka Gangy Cohen. I will do some digging with relatives and get back to you. I would also love to hear more about your book. I am also interested in speaking with anyone who knew Abe Shoenfeld. This is Thatgirl....granddaughter of Gangy Cohen...he did die in the mid 70's....I can get you more accurate info from my siblings or my dad if he will talk about it which he usually doesnt...my great grandparents on his side were from Austria.....As long as you are fair in your writings of my grandfather, I will be more then happy to try and help. dg333@roadrunner.com is my email. Let me know what you may need and I would like to be kept up to date on what your doing as in writing about him. Good Luck and again let me know what I may be able to help you with...as was said before by me...we didnt know Gangy...we knew Grandpa :) as you also can see my brother and sister have written on here as anonymous...there is some info there....let me know and good luck! Hi, this is ThatGirl...Grand daughter of Gangy Cohen . My email address has changed and wanted to update it if anyone wanted to get a hold of me.